We saw the unveiling of the Tesla Model 3 last week. Or rather, we thought we saw the unveiling. Everything looked great, especially the crazy futuristic interior. But Tesla CEO Elon Musk unleashed a series of cryptic tweets yesterday on the topic, and now we don’t know what to think. It’s not like we’re surprised we’d be hearing more about the Model 3, either. Musk has said for a while that last week’s event was only “part one” of the car’s debut, and that a second part was coming. In the mould of legacy automakers, it’d be easy to guess what was in part two. Maybe a few trim levels, something toned down for production, even a hotter version of the base model, if we got really lucky. I’m not sure how a driver will get information like current speed and Autopilot settings without some form of either an instrument cluster or a heads-up display, save for a direct-brain-transmission setup (not out of the realm of possibility for Tesla, let’s GET REAL for a second), but really, it’s Musk’s wording that’s weirding me out. In case you haven’t noticed by my handy-dandy use of italics, the use of the word “real,” in this context, is a bit off-putting. Most auto industry executives and engineers would use the words “production,” or “prototype,” not terminology that would allude to matters of authenticity. But we did see Model 3 prototypes driving around at the launch. If those steering wheels were not “real,” and were thus “fake,” which is the opposite of “real,” how were they moving around? Surely those were controlled somehow, right? Were they radio controlled? Magnet propelled? Borne aloft on nothing but the wings of hopes and dreams? 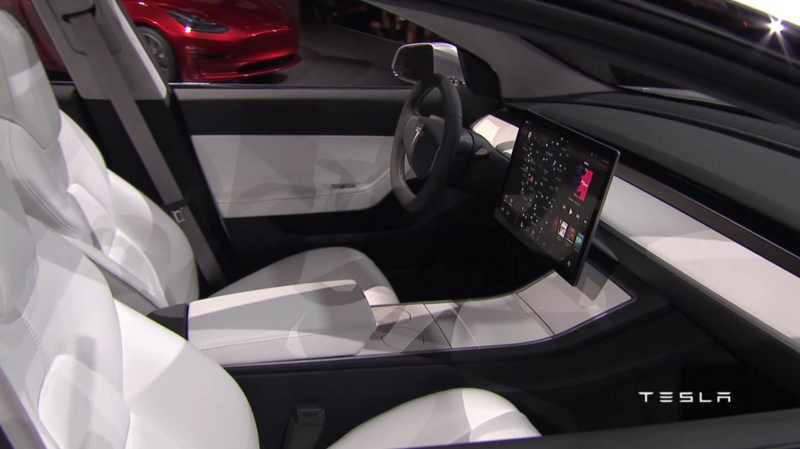 Theories as to the real Tesla Model 3 interior setup go in the comments below.